Samus is a rather unique character. She is relatively heavy, but is very floaty, traits not commonly seen paired together. While this helps Samus's horizontal recovery, it does slightly weaken her vertical recovery, with both traits countering eachother there. This also makes Samus unique in that she is a heavy character that is difficult to chain grab by characters such as Falco and Pikachu. However, the floaty trait of Samus somewhat hurts her air game; although she can stay in the air longer to string many aerials, her aerials don't combo well and this also gives her one of the worst short hop fast falls in the game, making it difficult to hit with her very strong back aerial unless she is edgeguarding. She is also rather fast moving for a heavy character, with decent dashing speed for a heavy character and a quite fast air speed, and this helps her run around the stage so she can bring out her powerful projectiles. Both Samus' are good at both close and long range. But apart from that they are quite opposite! Power Suit Samus is a lot stronger at a distance, where as Zero Suit Samus is a lot stronger close up! They appeal to completely different players styles! They're not designed to be completely defensive, so they have small jumps that limit their ability to recover from huge attacks. This is more of Power Suit Samus' problem more than Zero Suit Samus'. Long range attacks are Power suit Samus' speciality, and they can be used in conjunction to create devastating combos even at a distance. This makes for great ways to initiate the battle, especially considering that they are very good at setting up smash attacks immediately afterwards. In multiplayer battles or when you are facing an opponent that's better than you, try to use long range attacks to avoid taking damage. But even against worse opponents, use long range attacks as they are Samus's strong point. The charge shot is a nice knockout move, but don't rule out the super missile. Don't let her long range advantages keep you out of melee combat though, she also has attacks designed for close range so she's more of a rounded character. Just keep in mind that Samus should be at a distance most of the time. This can be annoying to some players as it makes Samus look like a big camper character like many Falco, Fox, and Snake players, so if you are concerned about that you may want to try a different character. However, you can play in close quarters and still be effective with Samus, as long as you know how to use her few very good melee range moves and set traps with Bomb to perform devastating combos. Use the grapple beam a lot as it's your longest-ranged melee attack. It can keep other fighters from getting close to you and it assists your long-range game. Punches then jabs her arm cannon. Useful to knock the opponent back to reset spacing and allow range to camp. Can also cause tripping at extremely low percents. Does a spin kick. Can be angled, and for non-angled, the move does less damage at the end of the foot. The same use as the neutral jab combo, but with more range for the non-angled variant, but with less damage. + + + + Suit Slice Damage: 13% on grounded opponents, 12% on aerial opponents. Samus holds her leg up and brings it down like an ax. 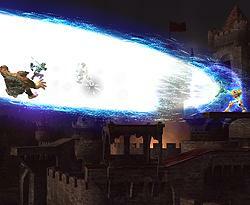 This move looks and acts like a meteor smash while the opponent is on the ground, but if used on an aerial opponent it will launch horizontally. Surprising knockback, but slow to start. A good anti-air move if you anticipate a short-hopped aerial or landing aerial. Also good for edgeguarding easy to anticipate recoveries such as Link's. 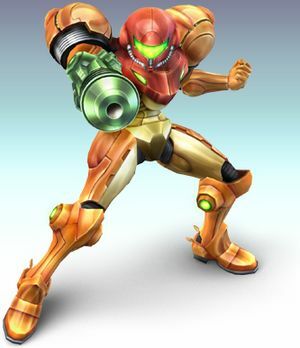 Samus points her arm cannon to the ground then blasts it with an explosion. It has a small amount cooldown but has great knockback. Very good for hitting opponents that get too close, but has poor range, so otherwise forward tilt is probably better. while dashing while dashing while dashing while dashing Suit Boost Damage: 10% at the beginning, 6% at the end. Samus charges forward with a small rocket boost. Has surprising range, going about 1/3 of Final Destination, but has low damage for the most likely hitbox and average knockback. Could be good for pressuring a shielding opponent when used together with homing missiles, as long as you make sure Samus will go behind the opponent to be immune to a shield grab. Then follow up with a down tilt or two and you'll be likely to shield poke. Smash + + + (Smash + ) or (Smash + ) or Cannon Bash Damage: Uncharged: 12% Down-angled, 13% Non-angled, and 14% Up-angled. Fully Charged: 16% Down-angled, 18% Non-angled, and 19% Up-angled. She jabs her arm cannon forwards. While this move has good knockback and can be angled, it has rather small range for a forward smash, making it not very useful. Down tilt or down smash are usually better options to KO, but this can be a good punish if the opponent misses a very laggy attack or uses a punishable attack in very close range. Smash + + + (Smash + ) or (Smash + ) or Fire Arch Damage: Uncharged: 4%, 4%, 4%, 5%, 6%; 23% if all hits connect. Fully Charged 5%, 5%, 5%, 7%, 8%; 32% if all hits connect. She shoots fire from her gun in an arch above her. This move has very poor knockback, and it's only use is for damage racking, but it can easily be punished due to it's very low knockback and opponents can easily DI out of it, making this a terrible move except on very large opponents such as Bowser, Donkey Kong, or King Dedede. Smash + + + (Smash + ) or (Smash + ) or Power Suit Spin Damage: Uncharged: 15% in front, 14% in back. Fully Charged 21% in front, 19% in back. Samus does a sweeping kick. Although its knockback is about the same as down tilt, this is generally a worse option due to the time it requires to finish the move, making punishing easier for the opponent. However, this does have better horizontal range, and hits behind as well, making it useful against roll-dodgers. In addition, it is lower than down tilt, making it easier to shield poke with this. All in all, it's Samus's most effective smash attack, but down tilt is still a more efficient KOing move. Samus grabs with her grapple beam. Like all tether grabs, this move is laggy if missed. Both Samus's dash grab and pivot grab are also extremely laggy if missed. This, paired with poor throws, makes Samus's grab game poor compared to most characters. She hits her opponent with her fist. Although it is very low damage, it is somewhat fast, so opponents likely won't be able to button mash out fast enough to avoid one or two of these, even at low percents, such as 30%. So even though it is low damage, every little bit helps. So use this if you are certain the opponent cannot break free in time. Also, as a fun fact, this move sometimes glitches on Bowser, causing her not being able to hit him. Samus flings her opponent forward. This (or back throw, depending on stage position) is what you should use most if you end up grabbing, as it is not only Samus's highest damaging throw (tied with up throw), but also throws the opponent away to reset spacing and allow projectile camping, which up throw lacks. Samus flings her opponent backward. Use this instead of forward throw depending on stage position, as throwing the opponent off the stage is usually the best place to throw them to rack up damage from edgeguarding, or to allow time to run away to camp. after grab after grab after grab after grab Grapple Twist Damage: 1%, 1%, 1%, 1%, 1%, 4%; 9% total. Spins her opponent above her, zapping then five times and then shooting them upwards. Honestly this is Samus's worst throw, as it doesn't reset spacing or allow for follow-ups. It's only real use it to use it against opponents that are easy to juggle, but Samus's bad up aerial makes this a poor choice still. Slings her opponet over her head and slams him back down. Although this is Samus's least damaging throw, it can be good at 0% as you can often times follow up a forward aerial, up aerial, neutral aerial, or back aerial against opponents with slow aerial attacks of their own. Drop Kick Damage: 9% right when it comes out, 6% for the rest of the move. Samus extends her leg to do a kick that gradually gets weaker. It has rather low knockback for a neutral aerial, as well as low damage, so this isn't normally that effective. However, it's better than forward aerial, so if you need to use an aerial but find yourself facing the opponent, use this instead. + + + + Cannon Blaze Damage: 4%, 3%, 3%, 3%, 5%; 21% if all hits connect. Shoots her cannon in an arch downwards. Although it has high damage, it is very easier to DI out of and only has noticeable knockback on the last hit (which is still very low), making this very easier to punish if any hits miss. + + + + Rear Kick Damage: 10% if her leg hits, 14% if her foot hits. Samus spins around, kicking backwards. It has solid damage, great knockback, and good speed. This is by far Samus's best aerial, her best non-projectile attack, and maybe even her best attack in general. The sweetspot is on Samus's foot, which has amazing knockback, killing most opponents easily at 100% if they are near the edge of a stage. Also a fantastic edgeguarder, with great range and power. Many opponents trying to recover will die at 60% from a sweetspotted back aerial, or at least be knocked far enough away that they are gimped and still die. Use this as a spacing tool as well. Also has almost no landing lag. There really isn't any reason not to use this move if you are backwards in the air. + + + + Drill Kick Damage: 3%, 1%, 1%, 1%, 1%, 4%; 11% if all hits connect. Samus drills upwards. This move has low damage and is easy to DI out of. In addition it has low knockback, which is only even noticeable on the last hit, making this easy to punish if even one hit misses. It is almost always a better idea to try to punish the landing or just run away to reset spacing if you end up hitting the opponent in the air above you. Samus swings her arm cannon downwards. This attack is a powerful meteor smash but it is slow. Don't use this attack much unless you have mastered how to time it to hit recovering opponents. If you do know how to use it though, it is quite devastating to opponents with very predictable recoveries such as Link. or or Grapple Beam Damage: 4% while extending, 7% at the end of it if it hits when it is finished extending. Samus uses her grapple beam to zap opponents. This move is infinitely useful as it is very long ranged (easily 1/3 of Final Destination), keeps opponents away from you, prevents them from recovering back to the stage and even KO at very high percentages! Learn to use this correctly as it is a very good poke, can grab ledges to recover, allows for follow ups when you land with it since it has absolutely no landing lag. Charge Shot Damage: 3%-25%, depending on how long it is charged. Charges a blue orb of energy to shoot out. Becomes more powerful the longer the button is pressed. This move, when fully charged, is a devastating finisher and edgeguarding move, but do not underestimate the smaller shots. Those, paired with missiles, very effectively stop jumps and pressures shields heavily. When you are against an opponent who recovers vertically, such as Marth, and is generally harder to edgeguard with missles, go ahead and charge this when they are recovering. Also charge this whenever an opponent has been KO'd and is coming back onstage. Just keep in mind that it is very deadly to you as well as it can be reflected, and against Lucas or Ness can be absorbed for an enormous amount of healing. Also keep in mind that Mr. Game & Watch can collect this in his bucket, which will make it a devastating KO move once fully filled. Fires a slow, short-ranged missile that homes in on the opponent. Use this a lot as this, paired with all of Samus's projectiles, and then also her long-ranged dash attack, will shield pressure an opponent very heavily, even causing shield breaks sometimes, or causing very high damage. Use these as opposed to Super Missiles if the opponent is closer to you and you want to decimate their shield (or cause extreme damage) by pairing many attacks together at one time. These allow you to do so because of their slow speed. Samus shoots a missile that has no homing capabilities, but has increased damage and speed. These are better than normal missiles for attacking at very long ranges due to lasting longer and flying faster. These are also very great edgeguarders if you do not have a fully charged neutral special when you knock an opponent offstage. + + + + Screw Attack Damage: 1%, 1%, 1%, 1%, 1%, 1%, 1%, 1%, 1%, 1%, 1%, 1%; 12% if all hits connect. Also does a small 2% hit that knocks the opponent into following hits if used on the ground. A rotating almost "electric" jump attack that can be used as a recovery move. The Screw Attack is quick if it is used on the ground, but it is able to be SDI'd out of and then punished hard. Usually only good as a recovery move, but is easy to spike when used in such a manner, so only use this is Samus's Grapple Beam won't reach the edge (such as if you are a ways below the edge). Samus turns into her Morph Ball mode and drops a single bomb. She can use this move to perform bomb jumps which can be use somewhat as recovery, but it is much less useful than it was in Super Smash Bros. Melee when used in such a manner. Instead, these are best used to set traps and cover your back while retreating away, similar in a fashion to Snake's grenades and C4. If you don't know how to set traps with these that well though, then don't. Instead just use then to cover yourself while retreating. or or or Shield Samus holds up a shield and slightly bends down, covering her face. The shield covers the entire body at the beginning but quickly decimates as it is held more or hit by more attacks. It will burst when it gets to the approximate size of one of her bombs. + or + + or + or Forward Roll Samus turns into her Morph Ball and rolls forwards, turning around as she gets up. Loses invincibility about 3/4 of the way into the roll. + or + + or + or Backward Roll Samus turns into her Morph Ball and rolls backwards. Almost exactly the same as forward roll, just in the opposite direction and without turning around. + or + + or + or Spot Dodge Samus ducks, putting her hand to the ground and crouching back. Loses invincibility as she stands up. She raises her hand as if saluting, then thrusts it down to her side. + ( or )+ or or She turns to the camera and holds up her arm cannon, which extends some things that spin. + She points her arm cannon behind her, then ducks and points it in front of her. , , , + , , , , , Sheds the Power Suit and transforms into Zero Suit Samus. This is very hard to perform though, as you have to perform them in extremely quick succession. Therefore, this is generally more of a "show-off" technique as it is so difficult to perform at all and there usually ins't any reason to want to switch to Zero Suit Samus unless you wanted to start with her in the first place. Zero Laser: Samus fully charges her laser and unleashes a powerful beam with maximum power. This beam, although it can do a lot of damage, is slow and can be jumped over. After this, her suit will fall off and you will transform into Zero Suit Samus. To become Samus again, use Zero Suit Samus' Final Smash. It has a weak point which can easily cause your death: While you are transforming into Zero Suit Samus, everyone who has a life remaining or having saved from the beam have enough time to charge an Smash against you, as you are not invincible while transforming and you cannot even use your Shield. Be careful with that if you use the Zero Laser! This page was last edited on 15 July 2013, at 23:38.